გერმანულ / ქართული (გერმანელი ხელოვანი იორგ ჰეროლდის და მისი ქართული სამუშაო ჯგუფის) სახელოვნებო სამუშაო შეხვედრების შედეგების პრეზენტაცია. კავკასიური დათვის ცხოვრების, მისი მონაცემების და დოკუმენტების ემპირიული ჩანაწერები. მსოფლიოს მცირე ნაწილში, აკრძალვის მიუხედავად თუ შევხვდებით დათვებზე ნადირობის შემთხვევებს. ერთ-ერთი ესეთი რეგიონი კავკასიაა. სავარაუდოთ აქ 1000-1200 დათვი ბინადრობს. მხოლოდ რამოდენიმე ორგანიზაცია თუ ზრუნავს ცხოველთა დაცვაზე. ნადირობის კვოტები, ერთად თავმოყრილი ინფორმაცია, უწყვეტი დოკუმენტაცია დათვების პოპულაციაზე არ არსებობს. იდეალური სიტუაცია თავისუფალი ნადირობსთვის. იორგ ეროლდი თავისი პროექტით “უკანასკნელი დათვი“ ცდილობს პილოტური სამუშაოს ჩატარებას. ქართველ ხელოვანებთან ერთად შეიქმნა ისტორიული დოკუმენტები, მოხდა ჟურნალისტების და ცხოველთა დამცველების გამოკითხვა დათვების ნადირობასთან დაკავშირებით და მხატვრულად იქნა ფორმულირებული დათვებთან მოპყრობის კონცეპტი, როგორც საზოგადოების პრობლემა. 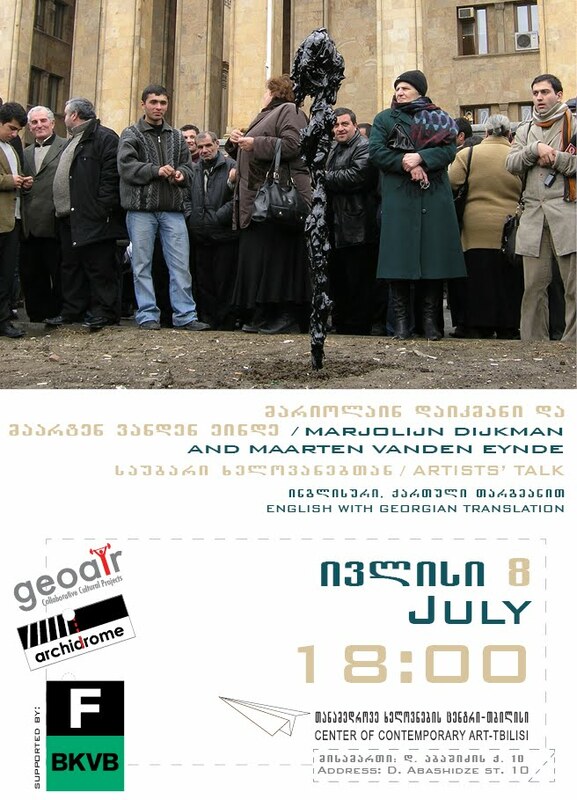 The presentation of the meetings of the German/Georgian (German artist Jorg Herold and his Georgian working group) artists. 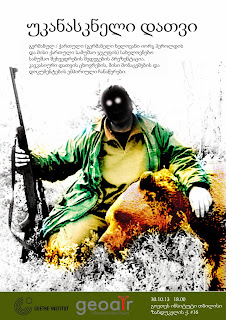 The empirical data of the life of the Caucasian Bear. Bear hunting still happens in some parts of the world, despite it being banned. One of these regions is the Caucasus. According to estimates about 1000 to 1200 bears live here. Only few organizations are concerned with the problem on the spot. The information about bear population,shooting quotas do not exist which is an ideal environment for hunting without any restrictions. Jörg Herold with the project 'The Last Bear' tries to raise awareness. Together with the Georgian artists, the historical documentation was created; the journalists and animal protection activists were interviewed about bear hunting. The concept of treating the bears was formulated artistically into a social problem. open call / კონკურსი/ იორგ ჰეროლდი/ 10 დღიანი ვორკშოფი ეთნოლოგისს თემაზე/ 21.10- 31.10. 2013.
გეოეარი, გოეთეს ინსტიტუტთან თანამშრომლობით გიწვევთ გერმანელი ხელოვანის, დოკუმენტური არქეოლოგის იორგ ჰეროლდის 10 დღიან ვორკშოპზე. ვორკშოპი დაეთმობა ეთნოლოგიის თემას, რიტუალებისა და ტრადიციების შესწავლას კავკასიაში, როგორიც არის, მაგალითად, მამაკაცის, როგორც “დათვებზე მონადირის” სახე. პროექტი, როგორც დოკუმენტური არქეოლოგია, იქნება ძიების, კვლევის მცდელობა, რომელიც განხორციელდება ხელოვნების სხვადასხვა მედიის საშუალებით და დასრულდება ნამუშევრების პრეზენტაციით. ვორკშოპში მონაწილეობა შეუძლიათ სხვადასხვა მედიაში მომუშავე ხელოვანებს/ სტუდენტებს. 21.10 - 10:00-14:00 ხელოვანის გაცნობა, მისი ნამუშევრების პრეზენტაცია. 22.10 - 10:00-14:00 გათვალისწინებულია, როგორც იდეების განვითერების და ჩამოყალიბების დღე. ხელოვანი იმუშავებს არქივებში, სადაც სურვილის მიხედვით მონაწილეებსაც შეუძლიათ შეუერთდნენ. 23.10. 10:00-14:00 ხელოვანის და მონაწილეების შეხვედრა, იდეების გაცვლა. 24.10 10:00-14:00 იდეების ფორმულირება, ლოგისტიკური დაგეგმარება. 25.-26.10 10:00 გამგზავრება მთაში. (სავარაუდოდ ყაზბეგში, ღამისთევით (ერთი ღამე). ადგილზე მუშაობა, თბილისში დაბრუნება. 30-31.10 - 10:00-14:00 ნამუშევრების პრეზენტაცია. მუშაობის დროს მოსალოდნელია ცვლილებები პროგრამაში. ინტერესის შემთხვევაში შესაძლებელი იქნება ხელოვანთან ინდივიდუალური შეხვედრა და მუშაობის გაგრძელება. იორგ ჰეროლდი დაიბადა ლაიფციგში 1965წ-ს. იგი სწავლობდა მხატვრობას ლაიფციგსა (Hochschule für Grafik und Buchkunst in Leipzig) და ბერლინში (Kunsthochschule Berlin-Weißensee). იორგ ჰეროლდი თავის შემოქმედებაში, როგორც დოკუმენტური არქეოლოგი (როგორც იგი თავის თავს უწოდებს), მისდევს მეხსიერების, მახსოვრობის, კვლევის მექანიზმს. როგორც თანამედროვე იგი ეძებს მოგონებების შეგნებულად გამოყენების საშუალებებს ხელოვნების სხვადასხვა მედიაში; ფერწერაში, ინსტალაციაში, ქანდაკებაში, ფილმში. მეხსიერების რეალურ და არარეალურ სამყაროში მოგზაურობების შედეგად იქმნება მისი ინსტალაციები, ფილმები, აქციები, ნახატები. დოკუმენტური არქეოლოგის ფუნქციაა, მოგონებების შესაძლებლობების მომავლისთვის ჩვენება და ხაზგასმა ეთიკურსა და ესთეტიკურ გამოსახულებას შორის კონფლიქტზე. 1985 წლიდან იორგ ჰეროლდი მუშაობს გალერეა EIGEN + ART-თან ერთად, რომელიც მას რეგულარულად წარადგენს ლაიფციგსა და ბერლინში. Jörg Herold was born in Leipzig in 1965. He studied painting in Hochschule für Grafik und Buchkunst in Leipzig and in Kunsthochschule Berlin-Weißensee. Jörg Herold, as a documentary archaeologist (as he refers to himself) researches memories. As a contemporary, purposely he searches for utilizing memories in various mediums: painting, installation, sculpture, film. After travelling to the real and unreal worlds of memories, his installations, films, paintings are created. The function of documentary archaeology is to show the possibilities of memories to the future and underline the conflict between ethical and aesthetic representations. Jörg Herold has been awarded with various prices, including: Leipziger Volkszeitung, 1999 and Kunstpreis der Stadt Wolfsburg, 2005. He is exhibitied in various museums and art institutions (Museum der Bildende Künste Leipzig, Heydt-Museum Wuppertal, Staatlichen Museum Schwerin, Galerie der Stadt Wolfsburg,Kunstverein Bielefeld). Also, he has participated in numerous international exhibitions, such as: Venice Biennial (1995); Documenta X (1997); exhibition dedicated to 40 years of video art at Leipzig Fine Art Museum; South Korea Seongnam Arts Center and LEEAHN Gallery (2012). From 1985, Jörg Herold works with Gallery EIGEN + ART, which presents him occasionally in Leipzig and Berlin.